The Arizona Attorney General’s Office concluded decades ago that voluntary positions aren’t exempt from the state constitution’s ban on legislators working for municipalities, a potentially bad omen for state Rep. Anthony Kern as he faces an ethics complaint related to his work with the Tombstone Marshal’s Office. Attorney General Robert Morrison said in a 1956 opinion a state legislator can’t hold office or be otherwise employed by an incorporated city or town, even if that position is unpaid. And the Arizona Supreme Court has long held that an officeholder who accepts a prohibited position is deemed to have vacated his office. Rebecca McHood, a progressive political activist, cited that opinion in a complaint she filed on Friday with the House Ethics Committee. McHood alleged that Kern violated a provision of the Arizona Constitution stating that legislators are prohibited from employment with the state or any of its counties or incorporated cities. The only exception to that rule is for school trustees, teachers or instructors in public schools. McHood also cited a provision of the Arizona Constitution stating that no person holding “any public office of profit or trust” under state or U.S. authority shall be a member of the Legislature. Kern, a Glendale Republican, called the complaint “unfounded” and expressed confidence that the Ethics Committee will dismiss it. But he did not address the merits of the complaint, and declined to comment to the Mirror. He emphasized in his response that his position in Tombstone was voluntary. His financial disclosure statements for 2016, 2017 and 2018 do not list the Tombstone Marshal’s Office as a source of compensation. According to the 1956 attorney general’s opinion, it doesn’t matter that the position was voluntary and unpaid. McHood asserted that Kern has effectively vacated his office as state representative by accepting a city job he’s prohibited from holding, pointing to case law cited in the 1956 opinion. However, that case didn’t involve a state legislator. The case in question involved a challenge to the appointment of William Hunter to the Industrial Commission of Arizona by Secretary of State James Kerby, who was serving as acting governor at the time while Gov. George W.P. Hunt was out of the state. Hunter declared that a previous Hunt appointee, Henry McCluskey, had vacated his seat, in part by accepting another appointment to a position that he was prohibited from holding by virtue of his membership on the Industrial Commission. The Arizona Supreme Court wrote in its 1928 ruling than an officeholder who accepts a second office he’s prohibited from holding effectively vacates the first office. But the court also noted that, in McCluskey v. Hunter, as well as in a previous case with a similar issue, the law didn’t bar an officeholder from the act of accepting another office. It simply required the person to vacate the first office. In the case of state lawmakers, the Arizona Constitution expressly prohibits them from accepting other employment with the state, counties or cities. Even if lawmakers resign from office, they’re still prohibited from employment with the state or its political subdivisions during the term they’ve been elected or appointed to. Nonetheless, the Attorney General’s Office referenced referenced the two Supreme Court rulings about officeholders automatically vacating their positions in its 1956 opinion, suggesting that it may have believed that principle applied to legislators. 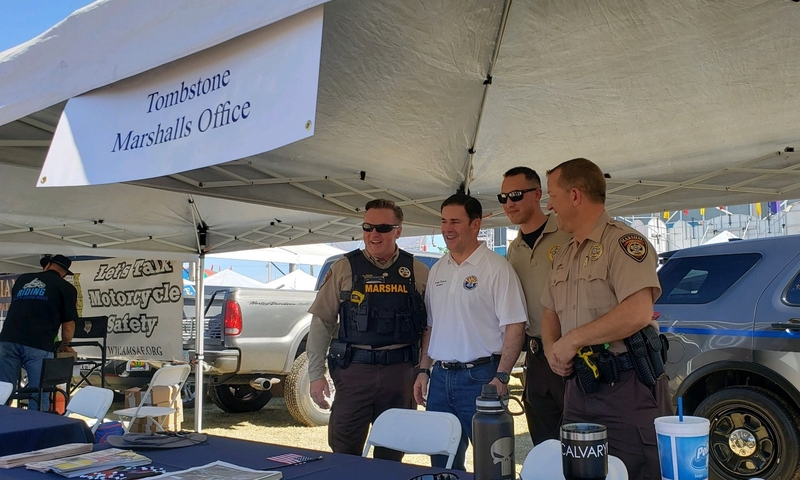 Kern joined the Tombstone Marshal’s Office in October 2016 and ended his employment there on March 8, according to records obtained from the Arizona Peace Officer Standards and Training Board. The termination of Kern’s employment in Tombstone came one day after The Arizona Republic reported that his name was added to the state’s “Brady list” – a list of law enforcement officials who have been accused of dishonesty – after he was fired from his position as a civilian code enforcement officer at the El Mirage Police Department for lying about repaying the department for a lost tablet computer. AZPOST records state that Kern’s employment in Tombstone did not end as a result of misconduct. Kern has not said why he left the job.